Compact, trailing habit with good variegated foliage of green and gold leaves. 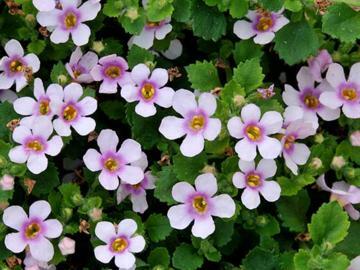 Masses of 5-petalled light pink flowers with a darker purple-pink central ring, freely produced throughout summer. Moist soil in sun or part-shade. Frost tender, needs protection to over-winter in cool areas. Often treated as an annual.